On a chilly winter night, there are a few gadgets, which can keep you warm without burning a hole in your pocket. One of those gadgets is infrared heaters, which are one of the safest and most economical devices for maintaining a comfortable temperature in the room. An infrared heater keeps you warm in a natural way, and you can keep it running for hours and hours, as it won’t consume much electricity as well. 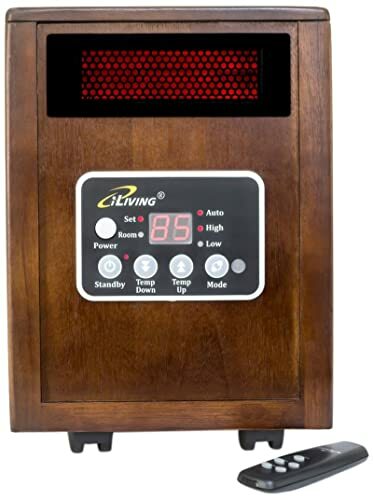 The difference between an infrared heater and a convection heater is that the former one heats up the objects that are placed in the room, whereas the latter one warms the air flowing in the room. If you are looking to experience a natural warmth, then you should opt for an infrared heater. With so many infrared heaters available on the market, finding the best infrared heater will not going to be easy. To help you find the best infrared heater, I’ve done the legwork. Therefore, the only thing left for you to do is go through five best infrared heater consumer report and pick the product that you feel is right for you. What Features To Consider When Buying An Infrared Heater? ​This heater is heralded as one of the most reliable propane fuelled heaters in the US. Being a portable infrared heater, you can easily set it up anywhere in the room. It doesn’t run on electricity, but propane gas. You just need to get a 1lb propane tank and start the heater. It is capable of heating a room of 225 sq. ft., of the area. The heater comes with two heat settings, low heat setting (4000 BTU) and high heat setting (9000 BTU). This is a highly durable unit, which comes with a porcelain-coated heating surface to distribute heat evenly, a wire guard in front of the heating source to protect users from unintentional burns and a fold down handle to reduce storage space. If the unit tips over, then it shuts down automatically to avoid any catastrophic event. The unit will also shut down if it detects low oxygen levels or if the pilot light doesn’t turn on. The only drawback of the unit is that it doesn’t come with a remote or timer, so you will have to go to the machine in order to control it. Being a medium-powerful heater, you can enhance your comfort level if you have an electric blanket in the room, especially when it gets freezing in your area. ​This infrared heater comes with 3D flame effects, which is displayed on the screen that has a view angle of 270 degrees. This technology is so unique and effective that Duraflame has patented it. The layered flames of the heater look real, courtesy of the beveled glass and side viewing windows. 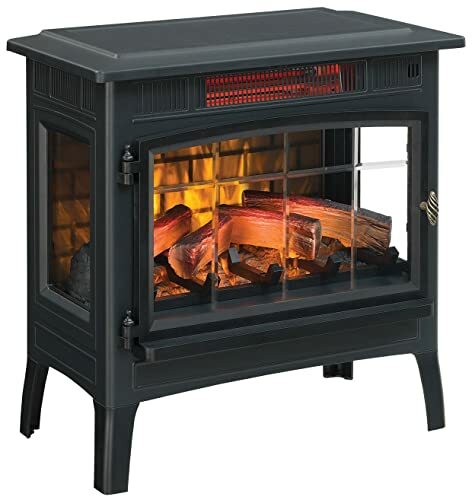 There is no better-infrared heater with better flame effects than this one from Duraflame. It isn’t just the 3D Flame technology that the company has focused on, but take a look at the construction of the overall unit. 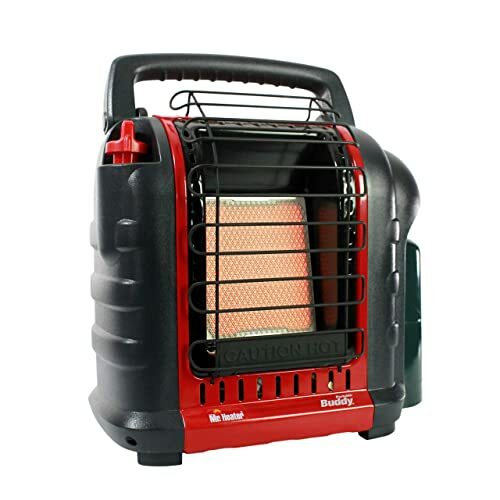 It sports a metallic body, which makes the heater durable and safe. Having a power of 1500 watts, the heater can easily heat a room as big as 1000 sq. ft. 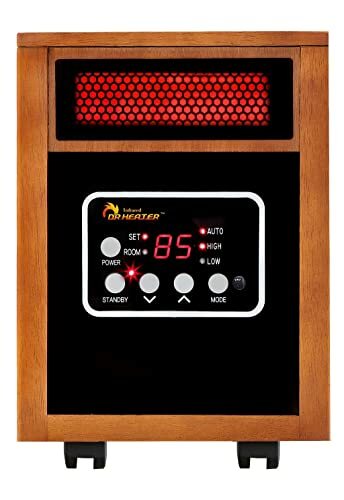 The infrared heater is equipped with a quality thermostat that ranges from 68 degrees Fahrenheit to 82 degrees Fahrenheit, which you can adjust via buttons given on the unit. Thankfully, the company has provided a remote with the heater that you can use to control the flame level, timer and other aspects of the unit. The only drawback of the unit is the position of the LCD display on which the temperature and timer settings. The display is set behind the stove door, so if you want to check the timer and/or temperature, then you will have to move out of bed and open the stove door. When you are looking for a smart and affordable infrared heater, you just can’t ignore Dr. Infrared Heater, as it a perfect blend of elegance and performance. In this heater, you will get three settings, Auto, low and high. Opting for ‘Auto’ mode will set the temperature of the unit between 50-86 degrees Fahrenheit. The heater is smart enough to select between low and high settings, as it monitors the ambient temperature in the room. Incorporated with a dual heating system and high-velocity blower, you can expect this heater to heat up your room (even if it is a big one) quickly. Despite being a powerful unit, it doesn’t make too much noise, so you can enjoy your sleep while the heater continues to keep your room warm and comfortable. The infrared heater comes with an Infrared remote control, which allows you to control the device from across the room. Therefore, you can control the unit by lying on your adjustable bed. To easily move the unit from one place to another, the company has added caster wheels at the base of it. This infrared heater produces 60 percent more heat compared to other 1500-watt heaters, courtesy of the advanced heating system. Moreover, the heater delivers about 250 degrees Fahrenheit at 3.5 m/s compared to 155 degrees Fahrenheit at 2.2 m/s. Overall, a highly-efficient machine that will quickly heat up your room and keep it that way. ​If yours is not a big room, then you don’t have to buy a powerful infrared heater. 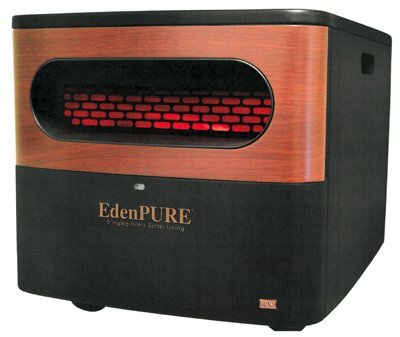 EdenPURE A5095 Infrared Heater is ideal for small rooms, as it is compact, lightweight and easy to transport. You will really like the way this IR heater heats up because it incorporates a mechanism that doesn’t let the unit gets too hot. This heater doesn’t emit carbon dioxide or any other harmful gas, which could pose health problems to you or your family members. This heater comes with a 6-ft power cable, which gives you the ability to place the heater close to the wall electrical outlet. ​This infrared heater is capable of heating a large room having an area of about 1,000 sq. ft. The heater emits twice as hot air as other models with same specs. Despite being a high-performance unit, it is extremely quiet, producing a sound of 39 decibels. Besides keeping the room hot, the heater keeps you safe as well, courtesy of ‘Overheat Protection System’ and ‘Tip-Over Switch Off’ mechanism. You will also be able to save your money with this heater, as it comes with ‘Auto Energy Saving Mode’ along with el-thermostat. If you turn on this mode, the heater can heat from 50 degrees to 86 degrees Fahrenheit. This heater is packed with some great features such as a beautiful front panel, low and high flow settings and auto shut-off timer. You will also find ‘Dual heating System’ in the heater, which amalgamates PTC Technology and an infrared tube of quartz. You can also control the unit with remote control, a feature that is not present in many infrared heaters. If you have used an electric heater to keep your house warm, then you will definitely be interested in knowing as to how an infrared heater performs in comparison with an electric heater. Electric heaters make use of a fan to distribute heat, whereas there is no fan in an infrared heater. Electric heaters rely on convection currents, so the air in front of the heater heats up and scatters all around the room. Infrared heaters, on the other hand, make use of infrared light rays to heat up objects placed directly in front of the unit. The heat emitted by the infrared heater is similar to the sunrays. As an infrared heater warming up the objects rather than air, therefore, the room is heated up rather quickly. Moreover, the moisture level in the air doesn’t dry when using an infrared heater, whereas an electric heater will dry up the moisture present in the air, resulting in a dry throat and sinus. This is why infrared heaters are so immensely popular with the users. With dozens of companies manufacturing infrared heaters of different shapes and sizes, it becomes important for you to consider a few factors in order to be able to identify the best-infrared heater for your home. The design of the infrared heater is of utmost importance because you will not want to buy a heater that makes your room look messy. So, decide whether you want a portable or stationary infrared heater. If you don’t know what distinguishes these two types, then let me discuss the details. Portable Electric Infrared Heaters are small-sized units and are not as powerful as stationary heaters, which you can mount on the wall or ceiling. If you have a room having an area of 100 sq. ft., then you will require an infrared heater with 1000 Watts of power. However, it is suggested to buy an infrared heater that has backup power storage, especially if you have an only infrared heater as the heating source. You need to check as to how the infrared heater functions and what features are incorporated into the machine. There are many features, which are included in an infrared heater such as operation modes, heater’s control, timer or thermostat to maintain temperature and so on. A heating element, which is not compliant with the safety standards of the industry, could pose some serious threats to your life. You will have to check as to which heating element is installed in the unit, whether it is halogen, ceramic, micathermic or carbon. A halogen is cheap and long-lasting, but it also emits harmful rays, which can affect your health. Rest all three types are safe but ceramic and carbon have a short lifespan, so you will have to buy a new one in a matter of 2-3 years. Micathermic is nothing but the metal tube that is made up of steel or aluminum. The spiral tube heats up and scatters that heat in the entire room. Infrared heaters have some obvious advantages over conventional heaters, but even then, your task doesn’t become easy. You will have to decide whether you want to a portable infrared heater or a stationary one, a powerful heater or a sleek one with less power. You need to check as to what heating element is installed in the heater as that will give you a better idea about the safety and reliability of the unit. What I’ve done for you is, I’ve laid out the best infrared heater consumer report in which you can see five infrared heaters with the same heating mechanism, but different design, operation capabilities, and safety features. Therefore, you need to go through these products and identify the one that you think would suit you best.